Optimal Multivitamin Methyl One 45 caps. Take 1 capsule daily with breakfast or lunch, or use as directed by your healthcare professional. Capsules may be opened and nutrients taken separately or sprinkled into food or drink. Do not take within 5 hours of bedtime as it may interfere with sleep. 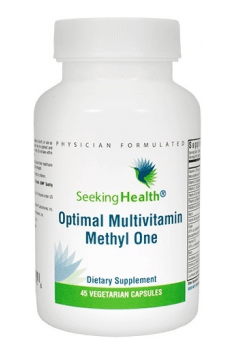 Seeking Health Optimal Multivitamin Methyl One will work perfectly as a daily dietary supplement, especially in the case of increased requirement for nutrients, e.g. when we train hard or struggle with diseases. It provides excellent support when our diet is not perfect and we do not consume enough fruits and vegetables. Take the dosage recommended by the manufacturer, which is one capsule daily, preferably with a meal. Complex dietary supplement supporting healthy joints. Molecular hydrogen is one of the most effective antioxidants that act in the intracellular area. Myo-inositol - the most frequent naturally occurring stereoisomer of inositol, a 6-carbon sugar with pro-health properties, also called vitamin B8. Its sources in food are mainly citruses, legumes and nuts. Human organism has the ability of its endogenous synthesis, it is the component of phosphatidylinositol, which is a precursor for some hormones (including insulin) and secondary transmitters responsible for processing intercellular signalization. Supplementation with myo-inositol demonstrates the ability to increase insulin sensitivity, thanks to which it may be successfully used by people dealing with insulin resistance. It also reduces hyperandrogenemia. Due to these scopes of effectiveness, myo-inositol is recommended to women with polycystic ovary syndrome and it is indicated as the most effective form of reducing the symptoms of PCOS. It is conducive to proper menstrual cycle. Moreover, myo-inositol demonstrates positive influence on mental functions. It is conducive to well-being, may have anti-depressant effect and reduce anxiety attacks. For this reason, it is used as an additive to energy drinks. For therapeutic purposes, myo-inositol is most frequently used with folic acid.